Utkal Divas or Odisha Day is celebrated on 1st April in Odisha in the memory of the formation of the state as a separate province on 1st April, 1936. Odisha (Oriya: ଓଡିଶା), also known as Orissa (Oriya: ଓଡି଼ଶା), is a state of India, located on the east coast of India, by the Bay of Bengal. The history or Odisha dates back to at least 3500 years. The famous Chedi and Matsya kingdom of Mahabharata is believed to be here. The defeat and demise of the last powerful king of Odisha Mukund Dev after a battle with the renegade Kalapahar saw a period of socio-political decline. The British annexed it in 1803 and on popular demand a separate state was formed on April 1, 1936. The movement was led by Utkal Gourab Madhusudan Das, Maharaja Krushna Chandra Gajapati, Pandit Nilakantha Das, Bhubanananda Das among others. The new state had six districts – Cuttack, Puri, Balasore, Sambalpur, Koraput and Ganjam. Cuttack was the capital. Odisha was the first state to be delineated on the modern line of languages. The struggle was hard. The officialdom of Bengal was not too keen but finally everyone came around to the fact that Odiya as a language is the oldest in the group of Odiya, Bengali and Assamese. 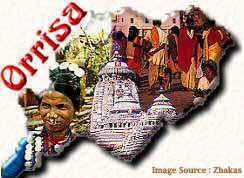 The movement persisted and Odisha got its statehood finally. Mahatma Gandhi was in tune with the linguistic line and post independence a number of princely states were incorporated into Odisha to give it the shape it has today. Penned by Kantakabi Laxmikanta Mohapatra the song reflects the pride and love and emotion for the land that once colonized Java, Sumatra, Bali, Borneo. The greatest piece of architecture bearing the Odiya stamp is the world heritage site of Angkor Vat, stately and majestic as the history of this ancient land – that transformed Ashoka to Ashoka the Great – on its way to recover and rekindle its glory. As part of Utkal Divas celebrations, cultural programmes, seminars and various competitive activities are organised in various parts of the state. The Day is celebrated as State Holiday in Odisha, ideal for a grand vacation witnessing cultural festivals across the state. Since 1st April is falling on friday, it will be great for a long weekend getaway..
Angul, Balangir, Baleshwar, Bargarh, Bauda, Bhadrak, Cuttack, Deogarh, Gajapati, Dhenkanal, Ganjam, Jagatsinghpur, Jajpur, Jharsuguda, Kalahandi, Kendrapara, Kendujhar, Khordha, Koraput, Malkangiri, Mayurbhanj, Nabarangapur, Nayagarh, Nuaparha, Puri, Rayagada, Sambalpur, Sonepur, Sundargarh.